A fantastic opportunity to acquire this prestigious 5 bedroomed family residence which occupies one of the finest positions in Holme village with stunning panoramic views. It includes extensive parking & garaging, ample gardens, range of outbuildings, & paddock. Option to purchase additional land. ABOUT UPPER LYDGATE FARM A fantastic opportunity to acquire this prestigious 5 bedroomed family residence which occupies one of the finest positions in Holme village with stunning panoramic views over the gardens, surrounding land, and far beyond. The property you see today, has been created by combining the double fronted farmhouse and adjoining barn by the current owners in the early 1990s and now provides very spacious and extensive accommoda-tion more than suitable for a growing family. A sweeping tree lined driveway gives ac-cess to Upper Lydgate Farm along with the former cow shed which provides garaging for several vehicles, extensive parking, a range of other outbuildings, gardens, and paddock all amounting to around 2 acres. There is the option to purchase by separate negotiation one or all of an additional 6 fields amounting to approximately 16 acres. HALLWAY With the first of two staircases rising to the first floor and giving access to the dining room and lounge. DINING ROOM 18' 1" x 14' 1" (5.51m x 4.29m) There are windows to the front and side offering delightful views. This formal dining room also has exposed beams, and stone chimney breast with inset stove set on a stone hearth and feature stonework wall to the side. LOUNGE 18' 1" x 15' 1" (5.51m x 4.6m) A pleasant room having a 'Stovax' stove resting on a stone hearth set into the chimney breast with timber mantel over. There are exposed beams, and window to the front. STUDY 13' 5" x 10' 2" (4.09m x 3.1m) A good-sized home office with large window to the front. SITTING ROOM 31' 6" x 18' 1" (9.6m x 5.51m) A fantastic reception room of over 30' x 18'. It is flooded with natural light courtesy of the glazed former barn opening with glazed door, windows to the rear throwing light over the second staircase, and French doors leading out to the rear. There is a large Dovre stove resting on a stone hearth set into the chimney breast. The sitting room is also partly open to the galleried landing area above. DINING KITCHEN 15' 10" x 15' 5" (4.83m x 4.7m) Fitted with a 'Smallbone' kitchen with an extensive range of wall, drawer, base and island units having granite work surfaces over incorporating two sinks with mixer tap over. Integrated appliances include an oil-fired Aga, dishwasher, 'Miele' hob, combination oven, and coffee machine. There is housing for a fridge/freezer. This fabulous kitchen also has illuminated display cabinets, book shelves, tiled splashbacks, pelmet and under unit enhancer lighting, ceiling spotlights, waste disposal unit, and hardwearing 'Karndean' flooring. There is space for a casual dining/breakfast table, and a pair of glazed doors open into the Conservatory. CONSERVATORY 15' 10" x 11' 7" (4.83m x 3.53m) Built from Iroko wood is this good-sized conservatory from where you can sit and take in some breath-taking views right across to Emley Moor. There are French doors leading out to the patio and gardens. The conservatory is finished with a tiled floor. UTILITY ROOM 15' 6" x 10' 11" (4.72m x 3.33m) Fitted with wall and base units having work surfaces over, Belfast sink, and ample floor to ceiling storage cupboards. You will also find plumbing for a washing machine, space for a tumble dryer, Worcester central heating boiler, tiled floor, and a window and stable style door to the rear. PANTRY A good-sized pantry with window to the rear, ample shelving, tiled floor, and space for a chest freezer. CLOAKROOM 4' 11" x 4' 11" (1.5m x 1.5m) Fitted with a white suite comprising a low flush w.c. and bracket wash basin. There are part tiled walls, tiled floor, and frosted window. CELLAR 14' 1" x 11' 11" (4.29m x 3.63m) A very useful cellar with vaulted ceiling and large central keeping slab. LANDING 13' 0" x 11' 0" (3.96m x 3.35m) A sizeable landing open to the roof timbers and with a light and airy galleried section over the sitting room. The remaining landing area has access to several storage rooms, a walk-in linen cupboard, and eaves space, along with a walk-in wardrobe off the spacious landing area at the far end. MASTER BEDROOM 18' 1" x 14' 1" (5.51m x 4.29m) Having windows to three elevations providing fabulous views over the gardens, land, and far across the valley towards Emley Moor. EN SUITE SHOWER ROOM 8' 10" x 6' 3" (2.69m x 1.91m) Fitted with a white suite comprising a low flush w.c., twin basin vanity sink unit with cupboards beneath and mirror over, and a large shower enclosure with mains shower over. You will also find a shaver socket, electric towel warmer, window to the front, mainly tiled walls, and tile effect flooring. BEDROOM 2 12' 9" x 10' 9" (3.89m x 3.28m) A good-sized guest suite with window to the front, and ceiling spotlighting. EN SUITE SHOWER ROOM 10' 9" x 5' 4" (3.28m x 1.63m) Fitted with a white suite comprising a pedestal wash basin, low flush w.c., bidet, and a large shower cubicle with Mira shower over. There is a window to the rear, and part tiled walls. BEDROOM 3 15' 3" x 15' 0" (4.65m x 4.57m) Another generously sized double bedroom with fine views to the front. BEDROOM 4 13' 9" x 13' 1" (4.19m x 3.99m) This fourth double bedroom has exposed beams, far reaching views to the front, ceiling spotlights, and feature curved wall backing onto the galleried landing area. BEDROOM 5 13' 9" x 10' 2" (4.19m x 3.1m) The smallest yet still a well-proportioned bedroom with views to the front, and ceiling spotlights. 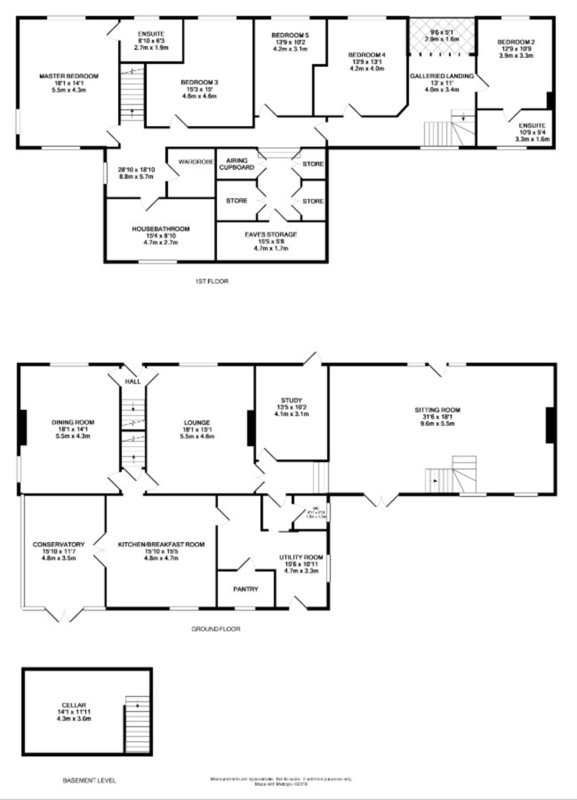 HOUSE BATHROOM 15' 4" x 8' 10" (4.67m x 2.69m) Rarely do you find a bathroom so spacious. It is fitted with a white suite comprising a multi-function 'Jacuzzi' bath, pedestal wash basin with mirror over, low flush w.c., bidet, and a large walk-in shower enclosure with multi jet system over. There are part tiled walls, ceiling spotlights, window to the rear, shaver socket, and a large built-in storage cupboard with pull out storage trays. OUTSIDE The sweeping tree lined driveway is accessed off Fieldhead Lane, the road that runs between Holme village and Digley Reservoir. There is ample parking and hardstanding, access to a substantial former cow shed that provides garaging for several vehicles, a range of other stone outbuildings, greenhouse, extensive gardens, duck pond, vegetable beds, 5-bar wooden gate leading from the front garden into the paddock, and a courtyard where there is a gate giving you right of access in front of the neighbouring property providing you with a shortcut into the cobbled village centre. There is the option to purchase by separate negotiation a further 6 fields amounting to approximately an additional 16 acres as indicated on the plan. TENURE We are informed that the property is freehold. You should ask your conveyancer to confirm this for you. VIEWING By appointment with Wm. Sykes & Son. LOCATION The property is approached up a tree lined driveway which is accessed off Fieldhead Lane, the road that runs between Holme village and Digley Reservoir.